founded in 1998 the institute for transacosutic research concentrates on the invention and definition of the term “transacoustics”, which researches the theory that by permanently changing the auditory angle and continually reinterpretating conventional manners of hearing, the borders of the acoustic and the audible can be expanded beyond the threshold of perception. in the magnetic probability fields of micro- and macro-sounds resides the last outpost of an observable reality. from this starting point the projection and distillation of an imaginary region, a conceivable vastness with digital and analogue sound processors, was attempted in several test arrangements. outpost presents intermediate results of this acoustic and visual expedition into a territory of incertitudes. the members of the institute for transacoustic research explore this expansive area for it's potential space between past and possible futures. marked by a rigid scientific approach, they build a space for sonic architectures. a game using the terms and structures of science and transfusing these into sound. an extensive booklet is attached to the cd with artwork by nikolaus gansterer. the drawings on the booklet were developed in close relation to the soundpieces. the set-up of the musical devices used on the cd acted as the inspiration to these time-based landscape drawings, in which the functional gives way to the fictional. 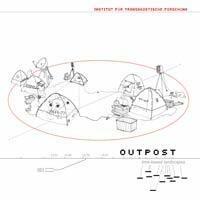 by researching the boundaries between the visual and the acoustic, the outpost release stands for a consequent restatement of intermedial fields.